Can the monarchies survive in a changing region? Known for their towering, ultramodern skyscrapers and jaw-dropping energy reserves, the six Arab monarchies of the Gulf Cooperation Council (GCC) are striving to improve regional stability amid the turmoil of the Arab Spring. 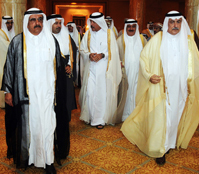 The economic and security coalition — made up of Bahrain, Kuwait, Oman, Qatar, Saudi Arabia and the United Arab Emirates — celebrates its 30th anniversary this year with huge fiscal surpluses that are financing, among other things, construction of state-of-the-art facilities for higher education and international sporting events. However, the six Sunni-led Muslim countries — key U.S. military allies — face ongoing unrest from a Shiite majority in Bahrain, uncertainty about the intentions of Shiite regimes in neighboring Iran and Iraq and an unstable Yemen, home to Al Qaeda-linked terrorists. The GCC countries also are struggling to balance their overdependence on foreign labor with the need for more jobs for their huge, youth populations.